Like wild rabbits, domestic rabbits have the tendency to chew on objects. Rabbits that are kept indoors will chew on anything from carpet to wooden table legs. 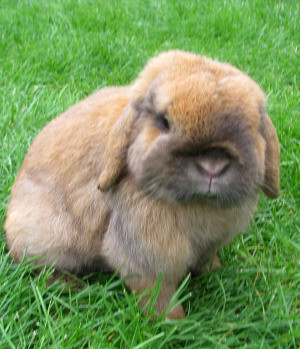 Owners must take care to rabbit-proof their home to prevent a rabbit’s normal behavior from becoming a major problem. Chewing is a natural rabbit behavior. In the wild, rabbits regularly chew on different plant materials that range from abrasive to soft. Rabbits’ teeth grow continuously throughout their lives and must be worn down regularly to prevent a variety of dental problems. To prevent these problems, rabbits have the instinct to nibble and gnaw on any object that is available. For domestic rabbits, this normal behavior can become an annoying and costly habit if not properly managed. The best way to prevent inappropriate chewing from becoming a problem is to provide your rabbit with appropriate chewing opportunities. This includes the provision of approved chew toys and items such as untreated wood or rope or compressed alfalfa cubes. Hay is an essential component of any rabbit’s diet and is also important for the chewing activity it promotes. Items such as a cardboard box with hay inside provide an opportunity to chew but also to engage in another natural activity — burrowing. As with many other behavioral problems with companion animals, a rabbit’s excessive chewing may indicate frustration or boredom. Consider whether your rabbit’s chewing could be due to a lack of attention or mental stimulation. You might consider enriching your rabbit’s environment, providing more interactive time with you, or perhaps acquiring a companion rabbit to alleviate boredom. Cover all electric cords with PVC tubing or plastic aquarium tubing. Cover the legs of wooden furniture with thick plastic or bubble wrap. Eliminate any dangling electrical cords. Remove any loose carpet or rugs from the area in which your rabbit will be permitted to roam freely. Provide your rabbit with appropriate chew toys and items to distract her from the items you wish to protect. Limit your rabbit’s access to one or two rooms in the house. By following these steps, you will be able to prevent rabbit chewing from decreasing the value of your home and from damaging the relationship between you and your rabbit. In addition, providing appropriate chewing items will prevent dental overgrowth or malocclusion.